She said after my TOM I should see a bigger loss ... tomorrow starts my 2nd week, and my TOM begins the end of this week. trying not to be too dissapointed. 5lbs is amazing! There is nothing to be disappointed about. Well done. Great job! Just know that some weeks you will only lose 1 or 2 pounds. Others you may lose 5 or 6. Don't be disappointed if you only avg. 2-3 pounds a week. Some lose more, some less. The only thing that we all know for sure is that this plan works as long as you are 100% committed and stay 100% on plan. Cheating, just once, is a slippery slope. So do yourself the favor that you deserve and commit to 100% all day, everyday! Ive been 100% OP. I am dissapointed though .... I see most people on their 1st WI lost 8-10 lbs. Thanks alot guys.... the kind and honest words help. I lost 6lbs on a WI 10 days after the first one and no TOM. Everyone is different and your body will decide what it can lose each week not someone else. Don't set yourself up for disappointment by comparing. Think about 5lbs that you never need to see again. And for me, I think about how many more months it would have taken me to get to where I am now if I was on a different program. 5 or 6lbs a week would have been impossible. very true KitKat. also ... its only been 7 days. 5lbs in 7 days ... is pretty cool. 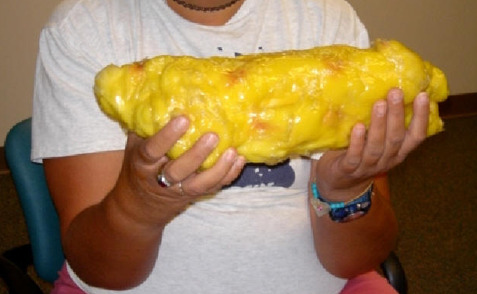 This is what 5 pounds of fat looks like.. I would say you did great!!!! (peanut butter and jelly tiiiiiime) scratching head ... maybe not the best song to sing? That is a great loss. Just remember any loss is a good loss. This is the only diet i have ever been on where i lost more than 1-2 pound per week. Don't be disappointed. Your WI will fluctuate throughout the program. I lost 6 pounds my first WI last week - I had a minute or two of -"gee, other people lost more" but then realized that 6 pounds is great. I have my second WI tonight and once again, I'm looking forward to it. Haven't have my TOM since January and before that October. I think I'm going thru the "change". Oh joy. good luck on your WI !!! That is fantastic!! I weighed in today and lost 3.5 pounds. Just keep up the great work and you will be in the slimmer/healthier body in no time! Good for you!! I will be so happy to see a 5 pound loss! I know that others lose a lot more especially their first week, but I will just be happy to see -3! I am on day one, so I don't know what to expect. I have not cheated and don't plan on it, but don't want to hope I lose 10 in a week. my first week on my diet, i lost 8lbs .... mostly by running to the toilet every time someone turned on a tap so i don't really count that. 5lbs the week before "that"!???? that's *phenomenal* - i'm lucky if i lose a single pound! it's more common for me to not lose anything at all or even gain even though i've been assiduous with the eating.